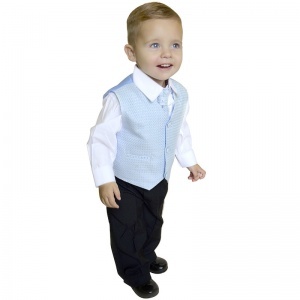 Boys blue & black 4 piece waistcoat suit for baby boys, toddler or older boys. The perfect boys suit for a christening or wedding. 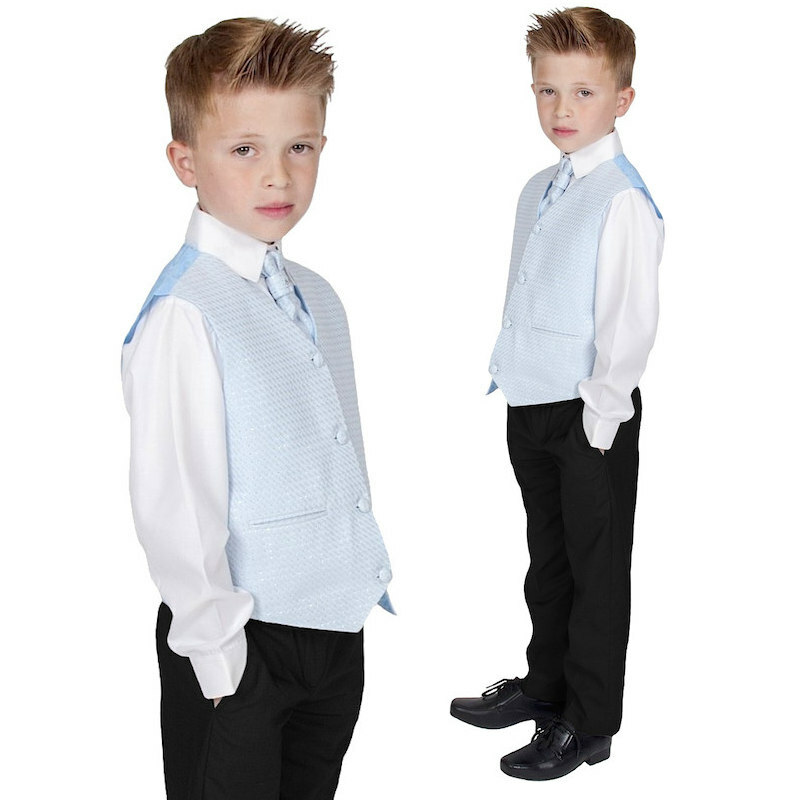 Waistcoat: Blue waistcoat with a diamond self-pattern on front with silver flecks, fully lined, double pockets, 3 centre buttons, adjustable strap/buckle on back for a perfect fit. Cravat: Blue cravat with matching diamond self-pattern with silver flecks and an actual diamante in the centre, velcro fastening at the back, complimenting the suit perfectly. 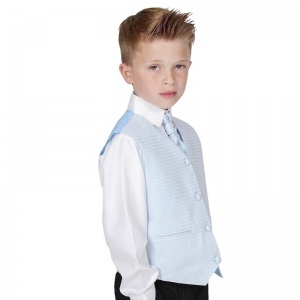 This boys blue suit will make him look like the perfect handsome gentleman at his christening or at a wedding as a guest or Page Boy. I chose this outfit as a wedding piece for my toddler. It arrived quickly, well packaged and neatly hung. It looked beautiful on, the quality is spot on for an outfit that would cost you so much more on other sites and in shops. Everyone that I spoke to that day commented on how smart my boy looked. I will be using this site for any upcoming occasion that my son will need kitted for. I bought this item for my sons christening, it's absolutely stunning, great material and very good value for money. Would definitely recommend for special occasions. 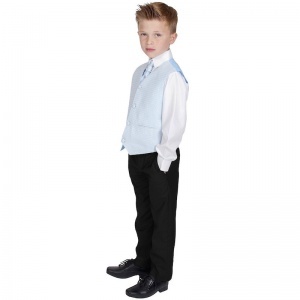 I would like to thank you for absolutely fantastic service, quick delivery and a brilliant little suit for my son! The suit it true to size and very well made. I look forward to ordering more from you in the future. Not going to lie, was slightly sceptical about the quality of the suit due to price, but I can honestly say, 100% worth the price + more!!! I brought this for my 11 month old to wear to a wedding and so many people complemented how gorgeous he looked! Arrived very quickly, decent quality and sizing perfect!! Defiantly will buy from here again in the future!!! Bought this suit for my 19 month old Grandson to wear at a family wedding. He looked amazing & stole the limelight somewhat. Great value, looked fab. So very pleased with this purchase. Bought suit for son's Christening. The sizing guide meant it fitted perfectly and everyone thought my little boy looked really cute. The suit arrived quickly and was well packaged. Would recommend as good value for money. The service was excellent and very prompt with good communication. The product is very soft our son happily wore the outfit for over 10 hours. Very good quality and workmanship.